Thank you for the opportunity to share Divine Diamonds Ministries’ mission to empower people to discover, pursue, live and thrive on purpose. We are excited and honored to announce our 10th Anniversary! For over ten years we have served, at no-cost or low-cost, supported, trained, equipped and empowered thousands of women and men through our comprehensive virtual and live transformation programs, weekly empowerment calls, personal development, life-coaching, business and ministry training, local, regional, national and international live events which are designed to inspire people to arise out of life’s limiting circumstances, shift mindsets, overcome and move forward to next-level living on purpose! Are you ready to expand your brand while supporting a great cause? 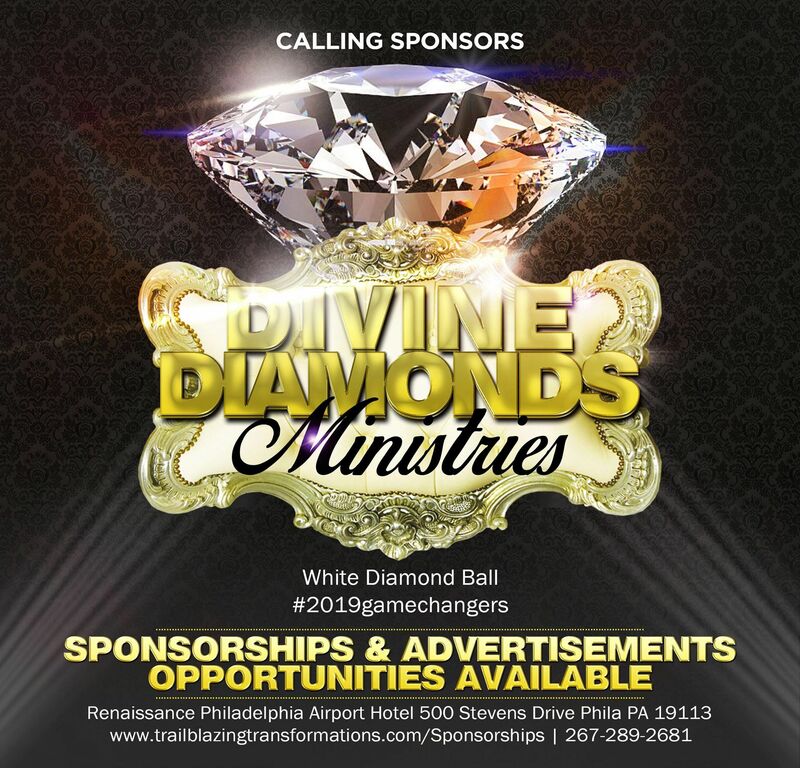 Divine Diamonds Ministries is a non-profit 501 (c) 3 charitable organization dedicated to game-changing and up-leveling lives, one person at a time. This year we are honoring seven purpose-driven National Game-Changers (spanning from California, Maryland, Florida, Louisiana and from our hometown of Philadelphia, Pennsylvania, including our first male Game-Changer) for their game-changing life accomplishments. In honor of our 10th Year Anniversary, we are premiering our Full Color 8X11 Program Advertisement Booklet. As an added bonus to our supporters, our full and half page color advertisement will be priced the same as last year. Are you ready to showcase your product or service before a live, engaged audience? I would love to speak with you directly, answer any questions you may have and further discuss the possibilities of a win-win collaboration or partnership. We greatly appreciate your consideration of sponsorship, advertisement or donation for this worthy cause of empowerment and transformation. Presenting Corporate White Diamond Sponsorship – $2000.00 which includes 4 complimentary VIP Tickets, Access to VIP Reception, 5-10 minutes Presentation from Platform of the White Diamond Ball, Dedicated Exhibition space at the Renaissance Hotel, Full Page Color Advertisement in our Program Book, Red Carpet Video Interview, Red-Carpet Photo Ops, Brand Logo listed on our Websites and Marketing Collateral and Social Media Promotion and Email Marketing of your Brand! Diamond Sponsorship – $1000.00 which includes 2 complimentary VIP Tickets, Access to VIP Reception, Dedicated Marketing Space, Half Page Color Advertisement in our Program Book, Red-Carpet Video Interview, Red-Carpet Photo Ops and Social Media Promotion and Email Marketing of your Brand. Small Business Sponsorship – $597.00 which includes 1 complimentary VIP Ticket and VIP Reception, Social Media Promotion & Email Marketing of your Brand, Dedicated Marketing Space, Red Carpet Interview and Photo Op. Are you ready for increased National awareness and accelerated promotion of your brand? Thank you again for your consideration, and please feel free to email me or call me with any questions or comments. I would like to thank you in advance for your support of this movement to transform lives and empower them to live on purpose. Please let us know if you have any questions. We look forward to making this a win-win collaboration.